Now that spring is upon us, most of us are looking to resume our favorite outdoor activities that we had to pause for the winter. For some, this means getting out in the garden. Gardening is a great way to get some sun, a light workout, and (perhaps most importantly) a bounty of delicious, nutritious, homegrown fruits and vegetables. Even those without a garden can reap the benefits of what Mother Nature has to offer. Eating plenty of fruits and vegetables this spring can boost your phytonutrient intake and give you tremendous health benefits. Below is my response to a recently asked question that I would like to share with all of you. Remember that if you’d like to ask your own question, go to www.oakwaynaturals.com and click on “Ask-the-Doctor” under “Doctor’s Corner” on the menu bar, or simply click here. I have been taking a multivitamin for years, but a friend of mine recently suggested finding one that contains “phytonutrients.” Apparently these come from plants and are good for people like me who don’t eat enough fruits and vegetables. Are these phytonutrients something I need to be taking, and do you recommend any particular product? While it’s good that you’ve at least been taking some sort of multivitamin, your friend is absolutely right that phytonutrients would benefit you since you say you don’t eat many fruits or vegetables. That being said, I would still encourage you to improve your fruit and vegetable intake, prior to supplementation, since nothing can beat well-balanced whole food nutrition. Let me briefly cover what phytonutrients are and then I’ll come back to your question regarding the multivitamin. Phytonutrients are substances that are produced by plants that help protect them from diseases and viruses. These phytochemicals, including antioxidants, are also beneficial for humans and have been shown to boost your immune system, reduce your blood pressure, protect against heart disease, slow the aging process, help prevent vision loss, and even protect against certain types of cancer. Phytonutrients are what give the fruits and vegetables their vibrant, deep, and bright colors (think orange, purples, white, and greens). There are over 10,000 naturally occurring types of phytonutrients in fruits and vegetables and, while you only require a small amount of them, the more you get the better. Eating at least 3-5 different colors each day is a great guide to getting these secondary metabolites that you need. Having a diet rich in phytonutrients is not about eating more greens, but rather the full rainbow of fruits and vegetables; eating broadly and colorfully is the key. Research suggests that eating a little of many different fruits and vegetables is much better than a lot of a few kinds. 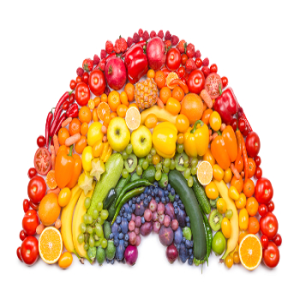 This colorful rainbow will give you all the bioflavonoids, lycopene, zeaxanthin, lutein, and resveratrol you need for healthy cell regeneration. Now, back to your question regarding a multivitamin, there are some limitations to what you can expect. In general, multivitamins are good for you. I’ve read surveys that suggest that out of all the medications and supplements doctors recommend, the multivitamin is the one that doctors are most likely to take their own advice on and use themselves. While that is a strong endorsement, people often overestimate what multivitamins can do for them and what they allow a person to omit from their diet and lifestyle. Supplementing a healthy lifestyle with a phytonutrient-containing multivitamin, however, may be exactly what certain people need to ward off disease and cover any missing gaps in their nutritional intake. Since the discovery of the importance of phytonutrients is fairly recent, they are not yet considered “essential nutrients” like most vitamins and minerals in your multivitamin. This is why most multivitamins on the market do not contain them at this point. However, if you are looking to stay on the cutting-edge of health and natural medicine, I like PhytoMulti by Metagenics. Metagenics’ Functional Medicine Research Center designed PhytoMulti to work as a “smart multivitamin” by utilizing phytonutrients in very unique ways. If you are someone who does a great job eating plenty of fruits and vegetables, you likely already get these nutrients and the benefits that come with them. But since it sounds like you are not, supplementing with a multivitamin that contains phytonutrients could be just what you need to keep your body feeling young, energetic, and healthy for years to come. Remember, though, it’s not about hitting the salad bar once a week and loading up on the iceberg lettuce; it’s about continuously eating a variety of colorful fruits and vegetables daily. FDA REQUIRED STATEMENT: Statements on this site, within this email, have not been evaluated by the Food and Drug Administration. Products are not intended to diagnose, treat, cure, or prevent any disease. Phytonutrients are substances that are produced by plants that help protect them from diseases and viruses. Having a diet rich in phytonutrients is not about eating more greens, but rather the full rainbow of fruits and vegetables; eating broadly and colorfully is the key. I’ve read surveys that suggest that out of all the medications and supplements doctors recommend, the multivitamin is the one that doctors are most likely to take their own advice on and use themselves.